Credit: University of Colorado Denver. 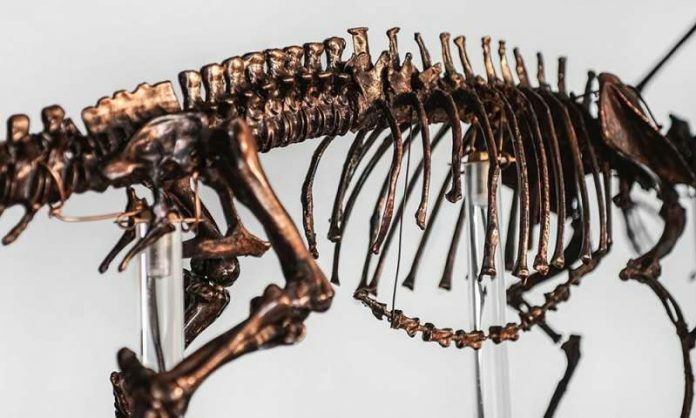 In a new study, scientists found perfectly preserved dinosaur skin in South Korea. They discovered a set of very small tracks with perfect skin traces near Jinju City, Korea. According to the researchers, these are the first tracks ever found where perfect skin impressions cover the entire surface of every track. The research was done by a team from the Chinju National University of Education and their colleagues in the U.S and China. Scientists have found lots of dinosaur bones and tracks. But it is quite rare to find soft tissue like muscles or skin in dinosaurs because these tissues are very hard to be preserved well. Previous research has shown that the skin patterns of different groups of dinosaurs varied and were signatures of differences in anatomy just like fingerprints. The skin traces come from tracks of the smallest known theropod, the Minisauripus. The current finding is the 10th discovery of a site with Minisauripus tracks and the first to show skin traces. In the study, the tracks were found during large-scale excavations and they were nearly lost. The team was able to stop the excavation when they found the first track on a broken slab. Later they found four more tracks with perfect skin traces. The researchers suggest that a blackbird-sized dinosaur stepped on a very thin layer of fine mud and left tracks. The skin texture of the foot was reproduced perfectly, without slipping or sliding. The team also found evidence that just before the tracks were made, there had been a rain shower leaving water-drop impressions. In one place, the dinosaur had stepped on a fresh raindrop mark. The rain came first, and the dinosaur step came second. The team found that the texture of the dinosaur skin is the grade of medium sandpaper, but it has the tiny scale traces in perfect arrays. Each little scale trace is only a third- or a half-millimeter in diameter. It is very similar to rare examples of mummified skin seen on the feet of feathered birds from China. But the team suggests that the shape of the feet of the Chinese birds and the Korean dinosaur were quite different. The skin pattern is similar to that from much larger, carnivorous theropod dinosaur tracks. In those tracks, the scales are much larger but never preserved across the whole footprint. The researchers suggest that the perfectly preserved Minisauripus skin texture they found is like a smaller version of the skin of a much larger relative. Future work will find out the relation between the two types of dinosaur tracks. One author of the study is Kyung-Soo Kim, Ph.D. from the Chinju National University of Education.